One of the advantages of WYDE conferences bridges is that in addition to standard definition voice codecs like iLBC, G.711 (uLaw, aLaw) and G.729; the WYDE bridge supports the following HD voice codecs: G.722, G.722.1 (siren7), G.722.2 (siren14), G.722.2 (AMR-WB), SILK16, SILK24, and ISAC. Why is HD Voice important? Traditional (PSTN) calls deliver sounds representing only a fraction of the range one would hear in a live conversation — the rest is deliberately filtered out. 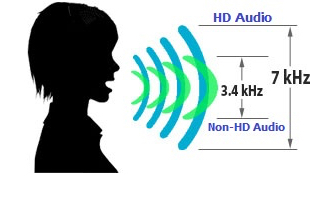 HD voice, while still not transmitting all audible frequencies, delivers enough of the ones relevant to human speech such that many listeners say it seems like the speaker is in the same room. Long calls, especially conference calls with multiple speakers with different accents, become less tiring and thus more productive. Let’s review it in details. Your calls sound quality highly depends on what audio codec is used to reproduce the speaker’s voice. Telephone networks use codecs to minimize the amount of bandwidth required for transmission; mobile phone companies use even more aggressive compression to meet their requirements. Because of that phone calls don’t replicate your actual speaking voice, for example differences between letters “S” and “F” or “P” and “T” or “N” and “L” during such conversations sometimes are hardly noticeable. 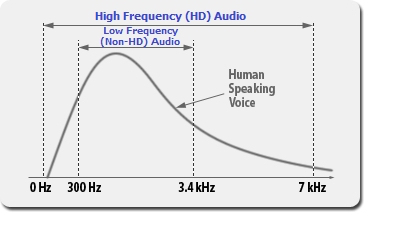 During ordinary conversations, human voice frequency is between 80 Hz and 8,000 Hz; but the most normal speech occurring between 300 Hz and 3,000 Hz. Because of that low bitrate audio codecs were designed to transmit only such frequencies. The goal of such codecs is to provide sufficient quality to be understood, but not to replicate speech quality. HD codecs supported by WYDE bridge provide more accurate, natural, better quality voice conversations, audio playback.